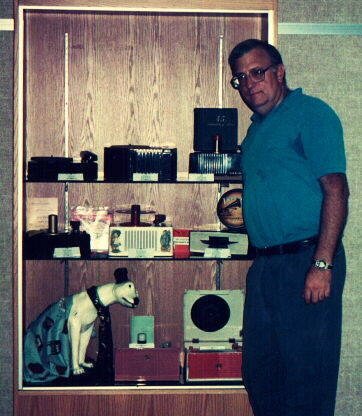 A number of years ago, John Dilks, a member of the New Jersey Antique Radio Club, successfully displayed Radios from 1914 through the 1950's at the County Library in Mays Landing. It seemed like a natural to club member Phil Vourtsis to have a display at the Monmouth County Library, since the club held its meetings at that time in Freehold, NJ. So for the month of August, three display cases were filled with RCA Radios and Phonographs from the 1920's through the 1950's. Since Phil's specialty is Phonographs, he enlisted the help of fellow club members Mark Mittleman and Tony Flanagan, to round out the display with vintage radios from the 20's and 30's. The Exhibit consisted of three showcases in the main lobby of the Headquarters Branch of the Monmouth County Library. 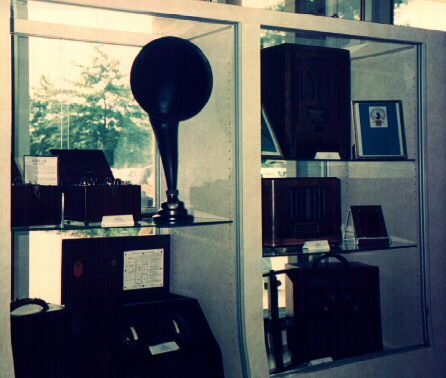 The showcase containing the oldest radios (1920's through 1930's) is located above-left. 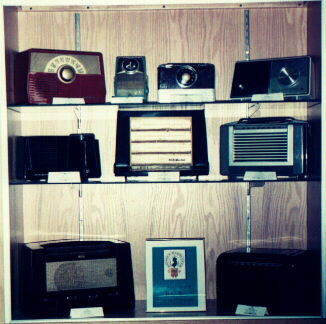 The showcase containing radios from the 1940's and 1950's is above-right. And the phonographs from the 1930's through the 1950's, are shown-left. The phonographs and many of the radios in this exhibit are part of a collection owned by Phil Vourtsis who lives in Manalapan Township. Phil has been collecting phonographs and radios for more than twenty years. He is a member of the Executive Board of the New Jersey Antique Radio Club and has the reputation of being "the guy who knows how to fix phonographs". Phil is always looking for phonographs and radios to save from the junk heap. So if you are looking for a good home for Aunt Millie's old set or have any questions about the exhibit or the Radio Club, call his toll-free number: 1-732-446-2427.